We’re very happy to announce a new partnership for Metrosonic! 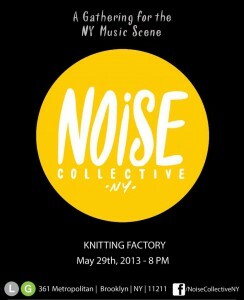 We hooked up with the guys over at Noise Collective NYC and will be officially co-sponsoring their next event on 5/29. Starting today you can submit your music to their playlist for a chance to win some free recording time at Metrosonic. If you’re not familiar with Noise Collective, it’s a monthly meet-up of artists, labels, bands, managers and basically anyone in the music business. They accept song submissions and the cream of the crop is put on the playlist for the live event! Metrosonic is going to be taking an extra special look at those submissions and we’re going to be giving our favorite artist 4 hours of recording time for free! We’re also going to be choosing 3 honorable mentions to receive 1 hour recording time each. or better yet submit to us IN PERSON at the live event 5/29 at the Knitting Factory Brooklyn! The last day to submit will be 5/29 and the winners will be announced Friday 6/7. Posted in News, Promotions & Contests, Updates and tagged Knitting Factory, knitting factory brooklyn, noise collective, noise collective nyc.